Wideouts were at a premium as 12 industry experts stocked their PPR rosters. At some point in this fantasy football draft season, the overreaching love for wide receivers will subside. At some point, fantasy owners will take a contrarian approach and look for undervalued running backs to be their franchise cornerstones. And at some point, there will be a limit as to how long drafters will continue to take backup wideouts before even considering who they’ll have starting at quarterback. The FLEX (Fantasy League of Experts) draft last weekend, however, was not one of those occasions. The 12 industry veterans who gathered at SiriusXM Radio headquarters in Washington, D.C., continued the preseason trend by placing a very high priority on receivers in their PPR draft. As expected, Antonio Brown of the Pittsburgh Steelers went first overall to Joe Dolan of Football Guys as one of six wideouts taken in the first seven picks. The only exception came in the No. 2 spot, where Dan Dobish of VegasInsider.com took running back Todd Gurley of the Los Angeles Rams. Then came the rapid-fire run of elite pass-catchers: Odell Beckham Jr., Julio Jones, A.J. Green, Dez Bryant and DeAndre Hopkins. Perhaps the scoring format of this particular league had something to do with it. Receptions count a full point. We start three receivers, plus two flex players. When my turn came up at No. 8 overall, I could follow the trend and draft Allen Robinson or Mike Evans … or I could take the road less traveled and go with a running back. With David Johnson of the Arizona Cardinals still available, going against the grain was a little easier. And so it began. In the first three rounds, 24 of the first 36 picks were wide receivers. Only three teams didn’t take at least two wideouts with their first three picks (and one of the teams with one wideout also picked tight end Rob Gronkowski). I won’t dwell too much on my team in particular, but there were a couple of key decision points for me that pretty much every fantasy owner will face in their drafts. The first came in Round 2, when I needed to take a wideout of my own to go with Johnson. Fortunately, there were still a few good ones available. After The Huddle’s Steve Gallo was the only owner to go RB-RB with his first two picks, I had my choice of Jordy Nelson, Keenan Allen, Brandon Marshall, Amari Cooper and Brandin Cooks. In what turned out to be a theme for me in this draft, I took a player with injury questions but the highest upside … Nelson. He was a top-five wideout two years ago (98 catches, 1519 yards, 13 TD) before missing all of last season with a torn knee ligament. A similar choice awaited in Round 3, when Buffalo Bills wideout Sammy Watkins was available as he works his way back from offseason foot surgery. I took him ahead of Golden Tate, Jeremy Maclin, Eric Decker and Julian Edelman as the round finished with a string of seven straight wide receivers. I went back to the injury well one more time in Round 7 with Cincinnati Bengals tight end Tyler Eifert, who had ankle surgery in late May and is expected to miss most of the preseason. Why so many injured players? Yes, it’s an extremely risky strategy, but there’s no prize in this league for finishing second. League belts have arrived! @FantasyJocks are the best! The earlier you draft before the start of the season, the more opportunity you have to take chances that can pay off down the road. I probably wouldn’t have put this team together if we drafted on Sept. 6. But on Aug. 6, I’m fine with it. Perhaps the most scrutinized pick of mine was the selection of quarterback Tom Brady in Round 8. Most owners seemed resigned to be patient with quarterbacks. At that point, only four – Andrew Luck, Cam Newton, Aaron Rodgers and Russell Wilson – were off the board. I really wanted Rodgers to pair with Nelson, but he went to Dobish with the next-to-last pick in Round 7. Perhaps I’d set my sights on taking a QB in that spot and didn’t fully evaluate my alternatives (note to other drafters: don’t do this), but when my turn came I was fully committed to grabbing the next-best quarterback on my board. I’m fully aware that unlike last year, Brady WILL serve his four-game suspension to start the season. But like many in the room, I also knew there are any number of quarterbacks who can put up productive fantasy numbers in any given week. But Brady, when he’s directing the New England Patriots offense with almost surgical precision, is someone who can be a difference-maker in fantasy. The Pats love to throw the ball, they have a red-zone monster in Gronkowski and they don’t turn it over. 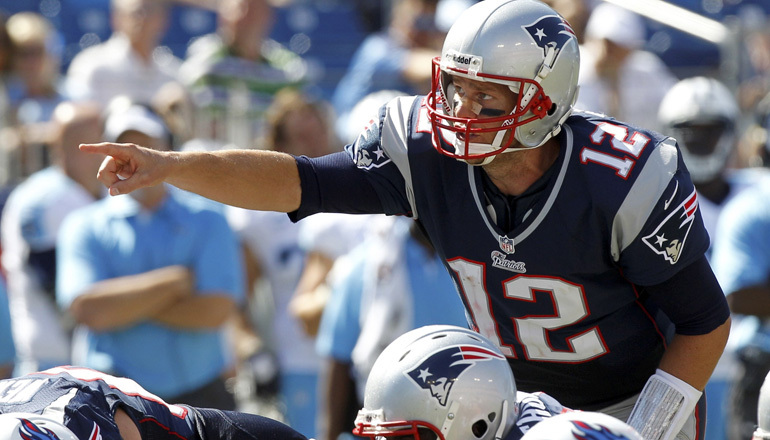 Brady led the NFL with 36 TD passes last season and threw only seven interceptions. He also ran for three more scores. That’s wonderful, you say, but what happens during those first four weeks when he’s not available? Ah yes. That’s where Oakland’s David Carr comes in. He threw 32 TD passes in 2015 and his first four games of this season are at New Orleans, vs. Atlanta, at Tennessee and at Baltimore. Not a bad schedule considering those teams ranked 32nd, 14th, 27th and 24th in points allowed last season. If you’re going to roll the dice with Brady, it’s imperative to get a solid backup for those four games he’ll miss. Carr in Round 13 filled that spot for me. As it turned out, Carr wasn’t the last quarterback to be drafted. Three owners waited even later to draft their starters. Dobish took Philip Rivers in Round 14 … and both Holden Kushner of FanDuel and Gallo of The Huddle waited until the final round to get theirs, taking Tyrod Taylor and Matthew Stafford with back-to-back picks in the 16th. Looking back, taking Brady where I did was probably a mistake. I would have preferred a running back such as Melvin Gordon, Theo Riddick or Justin Forsett – all of whom went before I picked in the ninth. Had I done that, I most likely still could have drafted Brady in the ninth, when Drew Brees and Ben Roethlisberger came off the board before I took Jay Ajayi as my third running back. One final point, I made sure to get some Eifert insurance in Round 10 by taking Jacksonville Jaguars tight end Julius Thomas. We can use a tight end as one of our two flex spots, and Thomas can be productive enough to start there, not just in Eifert’s place if he isn’t fully recovered by the start of the regular season. And because we all love preseason projections, the Draft Analyzer at FantasyPros.com provides plenty of trash-talking fodder. Although FLEX Leagues founder Jake Ciely of RotoExperts.com wears the early target as this year’s front-runner, the team I drafted looks like it has a pretty good chance to be competitive.